WASHINGTON — ThinKom’s recent collaborations with satellite operators Telesat and SES have the antenna builder jockeying to compete with Viasat, Isotropic Systems and others in the race to build affordable high-tech antennas that can link with satellite constellations in non-geosynchronous orbits. Hawthorne, California-based ThinKom tested a phased array antenna with SES in August, practicing links with O3b satellites in medium Earth orbit as they rose over the horizon and then tracking them for 30 minutes each. Last month, ThinKom and Telesat announced plans to test an antenna with a Telesat prototype satellite in low Earth orbit (LEO) and to collaborate on business-grade terminals for Telesat’s planned 120-satellite LEO constellation. Satellite operators and constellation ventures that want to offer broadband from space are increasingly focused on low-cost, flat-panel antennas that can track satellites in different orbits and support more throughput for higher data speeds than traditional dish antennas. The absence of such flat-panel antennas, as constellations start launching and high-throughput geostationary satellites grow in number, has satellite operators “all pretty much desperate to see somebody bring a solution to market,” according to Chris Quilty, president of Quilty Analytics. “That’s why the Inmarsats, SESs and Intelsats of the world have been investors in companies like Kymeta and Phasor, because they need to see these products to come to market,” he said. ThinKom is best known for its ThinAir Ku3030 antennas that inflight connectivity provider Gogo builds into its 2Ku airplane Wi-Fi terminals. ThinKom also builds enterprise antennas for customers in defense, oil and gas, and other markets. 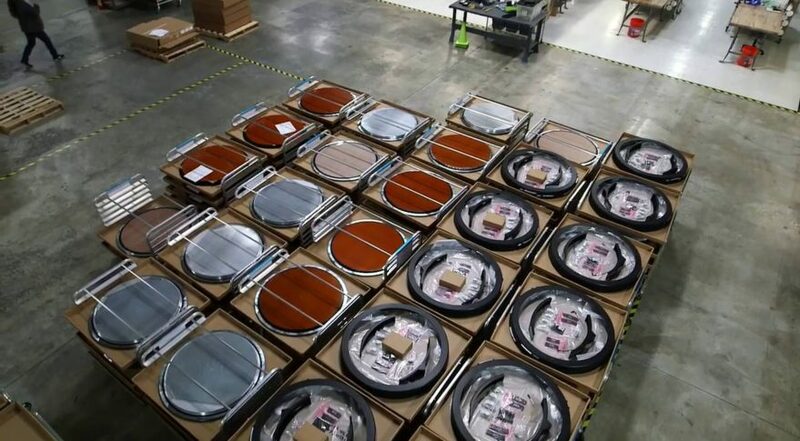 Bill Milroy, ThinKom’s chairman and chief technical officer, said his company intends to use the same phased array technology it has used for antennas on aircraft and other “on the move” platforms to create lower cost antennas for the non-geosynchronous-orbit constellation market. In an interview, Milroy said he is cautiously optimistic about new satellite constellations, believing one or more new systems will be successful. ThinKom has been burned once by constellation hype. In 2000, when the company was founded, its first contract was with Teledesic, a large constellation venture that collapsed three years later. Milroy said ThinKom is in discussions with another LEO satellite program for consumer terminals that would be significantly cheaper than those in the works for Telesat and SES, but declined to give names. SES is attempting to cultivate commercially viable flat-panel antennas for O3b mPower, its next-generation constellation, having contracted with Viasat, Alcan Systems and Isotropic Systems last year to build electronically steered antennas. Though not included in that list, ThinKom has every intention “to make sure our terminal is mPower capable,” Milroy said. “It would be dumb for us not to,” he said. ThinKom’s approach differs from SES’s other three partners in that its antennas don’t use electronic steering, despite being relatively flat. The aeronautical antenna it is testing with SES is 20 centimeters thick and uses mechanical systems to track satellites. Milroy said mechanical steering has the advantage of being able to link with satellites very close to the horizon — its O3b test closed links 13 degrees above the ground — but can be slow when switching links from one satellite to another. Whereas a ThinKom antenna requires around half a second to switch satellites, an electronically steered antenna has the potential to switch in microseconds, he said. Quilty said the ability of ThinKom antennas to maintain links with satellites so close to the horizon is noteworthy compared to electronically steered antennas since the sharper the angle, the harder it is for them to stay connected. ThinKom is targeting $10,000 for enterprise, or business-grade, terminals. Milroy said he envisions reaching volumes of around 10,000 or more enterprise terminals a year for Telesat, providing enough scale to keep prices low. For consumer terminals, ThinKom is targeting “sub-$1,000” prices. Whether that will be low enough for commercial success is still to be determined. Quilty said consumer prices will need to be “way lower,” to make an impact. “For a consumer terminal to be affordable with subsidization and volume, I would say sub-$500 at least,” he said. OneWeb and SpaceX have both mentioned consumer satellite broadband as a target market for their constellations of thousands of satellites.